One of the best things about luxury hotels is the quality of sleep you enjoy. A big part of that comes down to the quality of the bed you’re sleeping on, so buy yourself your dream bed from somewhere like Divan Beds Centre. Zip and link beds are great if you and your partner don’t agree on what constitutes a ‘luxury’ bed, which is likely to be the case if one of you loves a firm mattress while the other prefers a super soft mattress. A zip and link bed is the perfect solution as it means you can choose how your side feels to sleep on before zipping them together to join them up as one, without having to sleep in separate beds, and you can make it look like one solid bed by making sure it’s framed with a headboard that stretches the width of both. When you choose your headboard, make sure it’s something sophisticated! Velvet or leather with winged sides will look particularly high-end, especially if you choose one with deep buttoning. Another way to get that luxury feel in your own home is to invest in good quality bedding similar to the kind used in hotels. Invariably this means avoiding anything with high quantities of synthetic fibres such as polyester, opting for pure cotton or linen bedding instead. Good quality bedding is gentle on your skin (an especially important consideration if you have sensitive skin), and it also helps your skin to breathe on hot nights so that you don’t overheat or have a restless night. 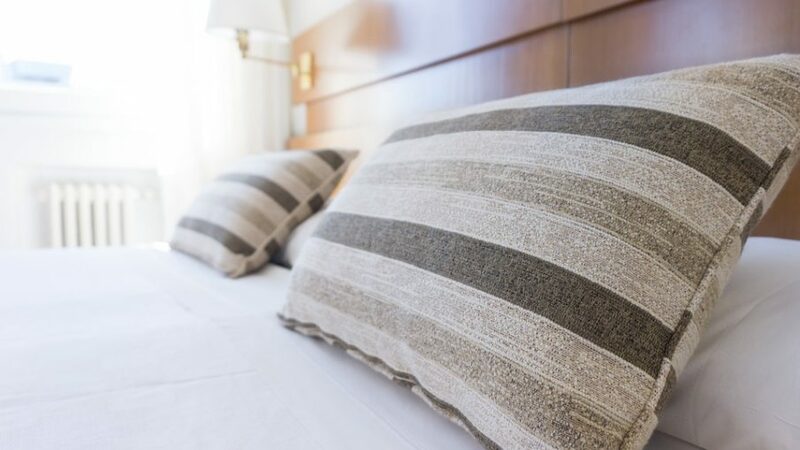 You don’t have to spend a fortune to find good quality bedding: high streets shops sell it, and there are plenty of places you can look online too. Another key feature of luxury hotels is the lighting you’ll find in them. You can recreate the luxury look in your home by planning out your lighting a little, ensuring that you have plenty of task lighting and ambient lighting as opposed to a single overhead ceiling light. So, place plenty of table lamps around your bedroom, consider putting wall lights on dimmers, and go the extra mile when it comes to wiring your lights up so that you can turn your lights off on a remote at your bedside… not having to get out of bed to switch off the lights just adds to the feeling of luxury, right!? Finally, luxury hotels pay attention to those little details you just don’t usually give time to at home. For example, the rooms are always spotlessly clean, there’s invariably a fluffy robe waiting for you, and you’ll have a station set up for coffees and teas to sip while you’re leafing through a magazine or flicking through the TV channels. So, give your room a good scrub (or treat yourself to a cleaning service to come and do it for you), stock up on reading material and curl up with a cup of tea. Serving it on a beautiful silver tray and making sure there are fresh flowers in your room will add even more luxury, as will a scented candle or a monogrammed towel if you’re feeling fancy!